Storm Erik worse than originally thought - Met Office extend warning as 76mph gales pummel N.I. The Met Office has reacted to a more severe than originally predicted Storm Erik by expanding a yellow status weather warning for Northern Ireland. The original warning was due to end at 6:00pm this evening but because of a further increase in winds from the west later on Friday evening they have extended the warning until midnight. The Met Office originally predicted gusts of up to 70mph for Northern Ireland but, according to BBC Weather NI, there was a gust measuring at 76mph recorded near Killowen in Co. Down. "A deep area of low pressure will bring windy and often wet weather across much of the UK on Friday and Saturday," said the Met Office. 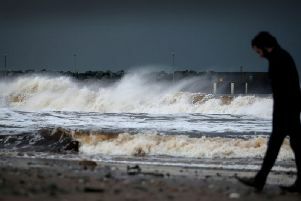 "A period of particularly strong winds will affect Northern Ireland and western Scotland on Friday, with gusts of 50 to 60 mph inland and occasionally 70 mph along exposed coasts. "After easing for a time early evening, a further increase in winds from the west will occur later on Friday evening." A further weather warning of wind for Northern Ireland will become active at 12:15am on Saturday and will remain in place until 3:00pm the same day. The two weather warnings apply to all of Northern Ireland.